The R. J. Mitchell wind tunnel is a large and extensively equipped low-speed wind tunnel with a 3.5 m x 2.4 m (11’x 8’) working section, with moving ground and a maximum wind speed of 40 m/s. It is ideally suited for vehicle aerodynamic work but is also equipped with a Nutem overhead 6-component balance, surface pressure scanning and PIV system for optical measurements of the airflow. This closed circuit, closed jet tunnel has been used extensively for Formula One and Indy Car race development work, for which it is very well equipped. 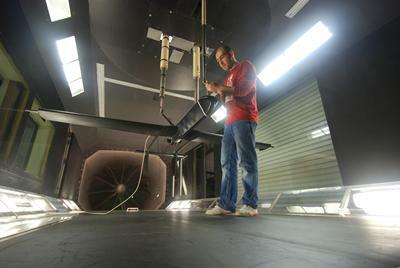 It is also suitable for a wide range of aerodynamic tests and has been used to simulate flows on underwater bodies.